Can great music be inspired by the throw of dice? The possibility clearly excited Josquin, who prefaced the tenor part in several of the movements of his Missa Di dadi with a pair of dice, each pair giving a different total score. 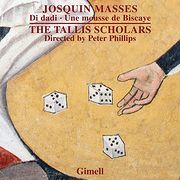 Both these Masses based on secular melodies seem to show Josquin as a young man exploring what he could do with the form. He would experiment further, and equally randomly, in other settings of the Mass. But here are two major variations on the timeless theme of how to set the Mass text, one with a particularly engaging history, and both yielding some superlative a cappella writing.